Accra, Oct. 27, GNA - The Ghana Football Association (GFA) and Ghana Telecom (GT) on Wednesday signed a 1.8 billion cedi sponsorship package for the National Premier League. The new agreement makes the telecommunications company the title sponsors of the league, which will now be dubbed "GT Premiership." The new sponsorship package records a 50 per cent increment on the 1.2 billion cedis that Kinapharma Company Limited gave out for the 2003 Premier League. Ghana Telecom as part of their commitment to the sponsorship of the league paid an initial deposit of 500 million cedis with the rest to be paid before the close of the season. 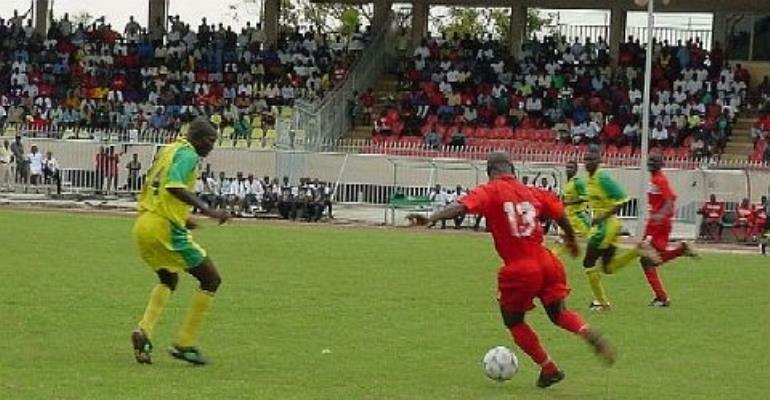 The zonal Premier League, which is currently on a two-week break, has five more matches for each zone for the completion of the season. Mr Oystein Bjorge, Chief Executive Officer of Ghana Telecom revealed at the signing on ceremony that a new package would be announced for the 2005 soccer season because the present one is just for the rest of the 2004 league season. He said the package is for two years and his company has an option of opening negotiations for a renewal after next season. Mr Bjorge however said GT is determined to sustain the newly formed relationship with the GFA since sports development is part of their agenda in the country. Dr. Nyaho Nyaho-Tamakloe, Chairman of the GFA said the new development is welcomed news for the Premier League clubs who are mostly in dire need of financial assistance. He said the legal committee of the two bodies would embark on further studies on the contract after which the details will be revealed to the public. Dr Nyaho-Tamakloe was confident that the company would reap enough benefits from the deal. It would be recalled that Kinapharma Limited, a pharmaceutical company last year sponsored the league with 1.2 billion cedis with almost half of the package in the form of products of the company, whilst the rest was in cash. The GT deal is however coming in the form of pure cash and information reaching the GNA Sports Desk indicates that each club is likely to get 100 million cedis from the package. Premier League clubs welcome new package from GT Accra, Oct. 27, GNA - The new sponsorship package from Ghana Telecom (GT) for the 2004 Premier League has been described by most of the Premier clubs as a big relief to their financial plights. The 1.8 billion cedi package is likely to see the Premier League clubs each pocketing 100 million cedis by the end of the season. What even makes it more soothing news for the clubs is that the new deal is coming at a time that the league has only five matches left in each zone to end. Views sampled by the GNA Sports from officials of the Premier League clubs gives an indication that the clubs are extremely impressed with the package and are amazed at the display of total commitment on the part of GT, even when the league is about to end. To most of the clubs, GT has shown that they are really in to do business whilst the clubs on the other hand have also expressed determination to support the cause. Mr Adam Munkaila, Vice Chairman of Real Tamale United (RTU) who spoke to the GNA Sports after the ceremony described the new sponsorship as an attractive offer, which will ease the financial burden of the clubs. He said though the amount cannot cater for all the expenses of a club like RTU, it would go a long way to help them to take care of their fuel expenses, allowances and other expenditures. Mr Oduro Nyarko, an Accra Representative of Okwawu United told the cedis would ensure that they cater for the salaries of the players for at least six to seven months. "Taking a look at the budget of my club, I think this package would be of a tremendous help to us", Mr Nyarko added. Mr Andy Sam, Chief Executive of Obuasi AshantiGold also shared the same views with his other colleagues. He said the deal is a good offer especially when it is coming at a time that the league is just about to end. According to Mr Sam, the clubs must be very grateful to Ghana Telecom for coming to their aid at this crucial moment. On the part of Mr Emmanuel Adottey, Chairman of Power FC, the 100 million cedis is a hefty offer for his club, which he described as a small club. According to Mr Adottey, most of the smaller clubs do not have big budgets therefore his club will witness enough benefits from the package.